It’s hard to beat the hype over the solar eclipse, but it’s time for the Tuesday Stretch! BugDoc Dave here tonight! In my last article, I covered some of the green colors that showed up at the Stretch Glass Society’s Convention. 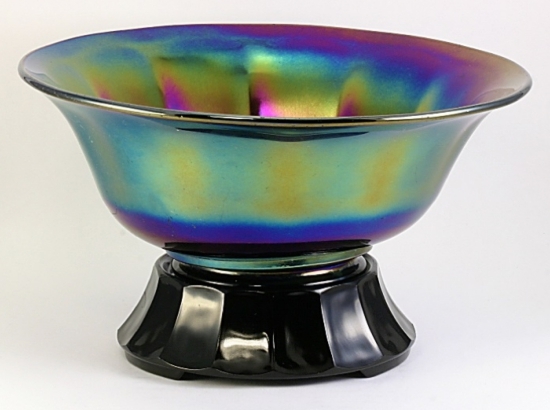 At the convention, I was asked to give a presentation on some of the subtle differences used to identify 8-10 inch size bowls and discuss some of the glass stand/bases that were sold for these bowls. I mentioned yesterday that an Imperial Jewels piece had been placed on the wrong base. Actually, I don’t like to make such strong statements and I should simply state that the base and bowl were made by different manufacturers! I see this all the time in malls and at shows where a dealer has married a piece of glass with a black base that seems to fit. In some cases, I see black bases that were designed for stretch glass pieces holding pottery, or glass made in entirely different eras, etc. 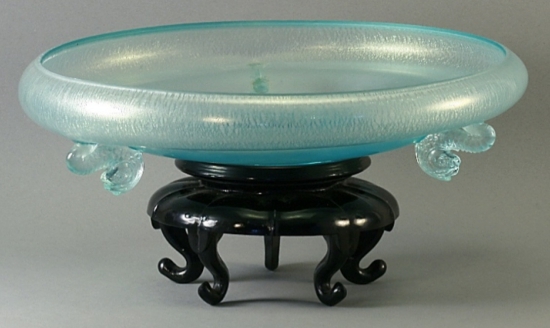 Bottom line, these glass bases tend to set off the piece being sold. Often, when I look at the base, it isn’t even for sale and is being used as a display item. It’s too difficult to cover all the glass bases made by the various glass companies, but I’d like to point out several that are obvious, and should be easy to attribute to the correct company. First, three companies regularly impressed a number in their bases. If the number is on the top, inside a little round depression, the base was made by Cambridge. Since Cambridge didn’t make stretch glass, I don’t want to spend much time on these other than to state that they come in many sizes from #00 to #9. If the number is on the underside, it is most likely made by Northwood, but U.S. Glass numbered a few of their bases. In fact, it is rare for a Northwood base to not be numbered! Most of the Northwood bases have three toes and a gradual gradation of rounded rings. 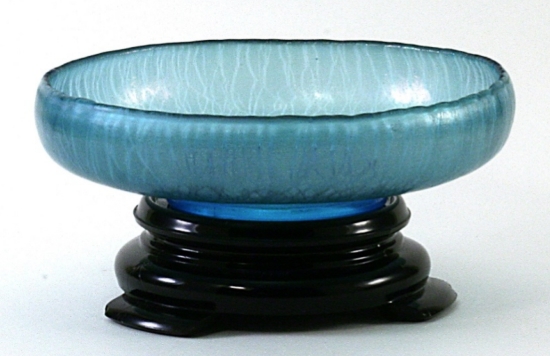 The larger Northwood bases are very similar to the Fenton #604 base (the one that holds their punch bowl and large vase). 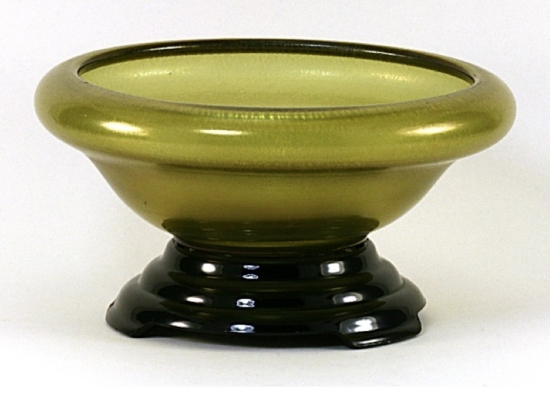 The Fenton base is just large enough to hold the 4-inch diameter base of the bowl and vase. The Northwood bases will be either too small or slightly larger (and they usually have numbers). This is the Northwood #301/638 base that looks like the Fenton one except for the opening size and number. The #616 base is nearly identical to the #301 except that the holder diameter is slightly larger! The #640 base is the smallest that Northwood made and fits all the 640 line of bowls. The one Northwood base that isn’t marked is the “high standard” base. 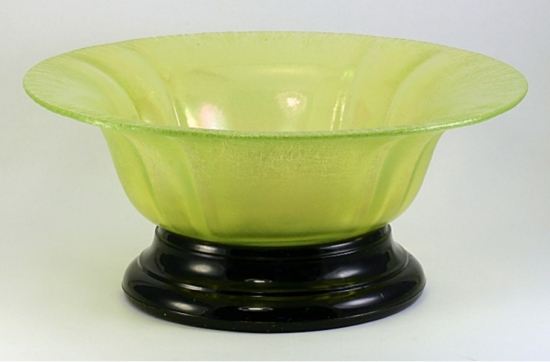 This looks like some kind of strange ice cream dish or comport. It isn’t common and is almost always misidentified as something other than a base!! The Northwood catalog pages show two version of this base, but only one size has been found…so far! 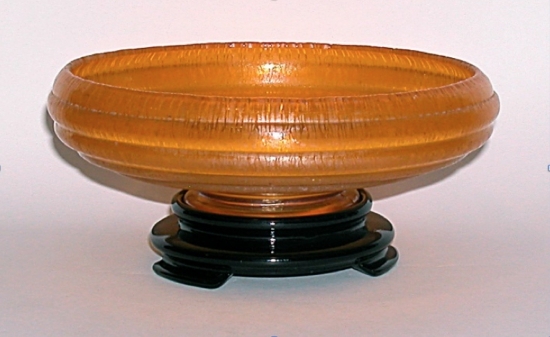 U.S. Glass made round bases that have no “toes.” These are commonly found in shops and at shows upside down and labelled “small bowl.” These occasionally have numbers inside. 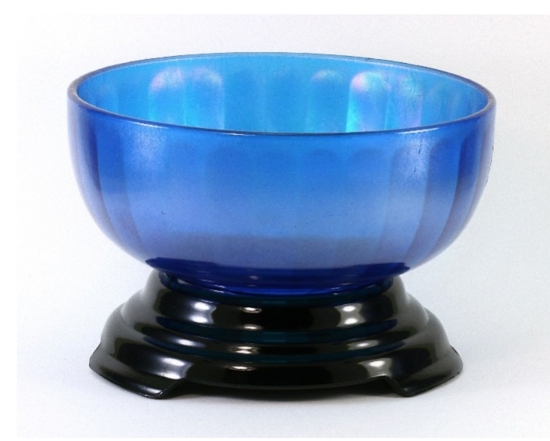 If you find these bases with a satin finish, they were used for satin finish bowls, not stretch glass. The most common U.S. Glass, round base comes in four different sizes. Probably the easiest base to identify is the one made by Imperial for their wide panel bowls. These bases also have three toes and wide panels around the outside. Two sizes are known and they were only used with the wide panel bowls. Another fairly easy base to identify is the Diamond “duck-foot” bases. These bases usually have a platform that is raised up (not a gradual slope from the top to the toes) and the toes definitely stick out. 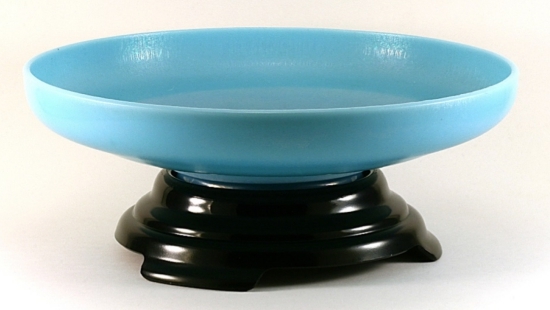 These “duck-foot” bases can be found in several sizes, each of which fit different bowl lines. 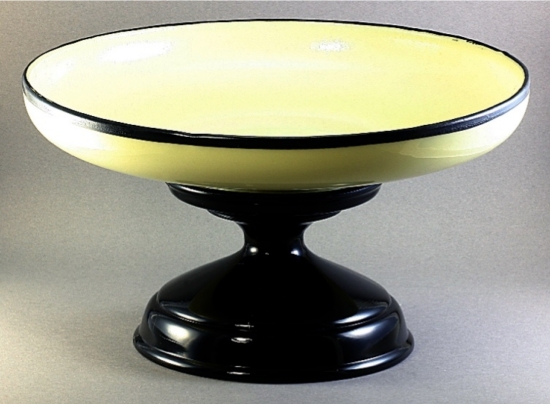 Fenton made several styles of black bases but the ones with equally spaced rings that get larger towards the base are pretty easy to spot. 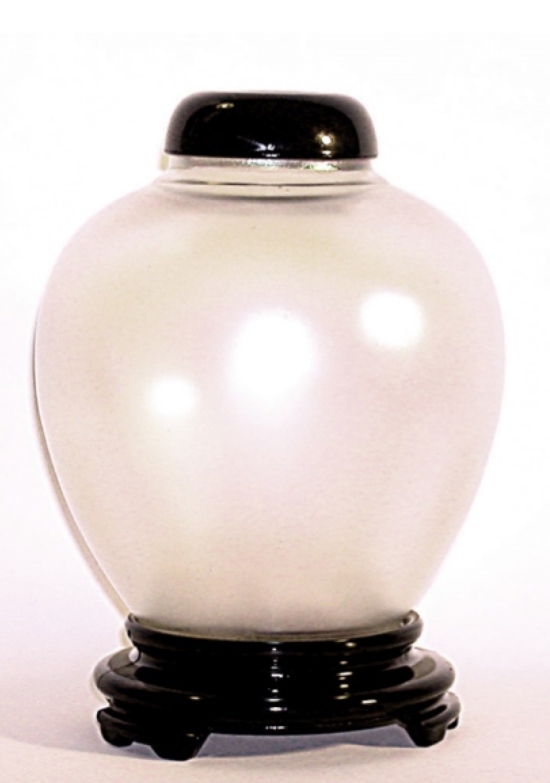 Fenton also made a fairly unique base that has a small platform and a wide, rounded foundation. This base comes in several sizes. 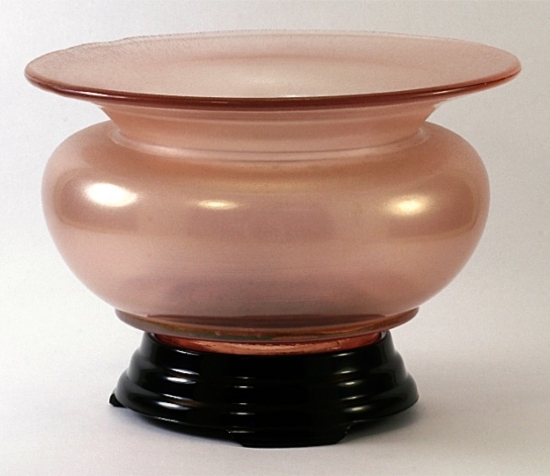 Two unique bases made by Fenton are the ginger jar base and the long, five-footed base. The ginger jar base has the narrow platform and rounded base, but each toe has a slit in the middle. The five-footed bases were often used for dolphin pieces. Well, that’s enough bases for this session! These black bases are becoming more difficult to find, so don’t pass them up if you collect stretch glass. Most of the companies that made stretch glass also made bases for each item. 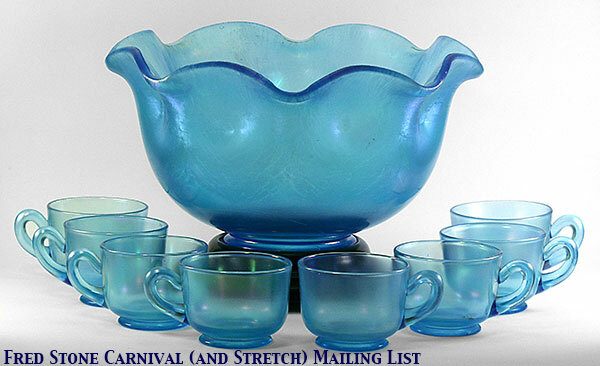 However, we know from catalog pages that the bases and bowls were sold separately, so there are many more bowls than bases!